FIVE TIMES THE DANGER! FIVE TIMES THE LAZARUS GRAY! THE ADVENTURES OF LAZARUS GRAY VOLUME FIVE NOW ON AUDIO! FIVE TIMES THE DANGER! FIVE TIMES THE LAZARUS GRAY! THE ADVENTURES OF LAZARUS GRAY VOLUME FIVE NOW ON AUDIO! Barry Reese is back! And so is Lazarus Gray! In this fifth volume, events are in motion that will forever shape the future legacy of Lazarus Gray and his allies! THE ADVENTURES OF LAZARUS GRAY VOLUME FIVE from Pro Se Productions is Reese doing what he does best. Don’t miss it! Now available as a quality audiobook produced by Radio Archives. The winds of change blow for everyone...even Lazarus Gray. 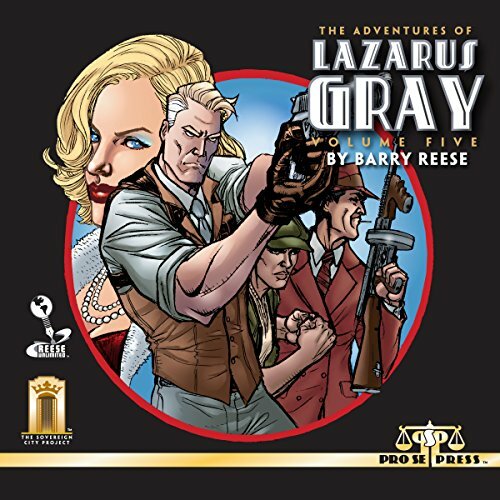 THE ADVENTURES OF LAZARUS GRAY VOLUME FIVE by Barry Reese continues the tale of the man once without identity and now filled only with purpose! Forming an alliance with other lost souls, Gray and his team stand as Assistance Unlimited and now face their greatest threats ever! Thrill along with Gray and Assistance Unlimited as they face new dangers, battle old foes, and even cross paths with Ron Fortier’s mysterious undead avenger - Brother Bones! Prepare yourself for the unexpected as you return to Sovereign City and The Adventures of Lazarus Gray, from Reese Unlimited and Pro Se Productions. This over the top action packed audio book is also available on Audible and Itunes. THE ADVENTURES OF LAZARUS GRAY VOLUME FIVE is available in print and digital formats at Amazon and www.prose-press.com. SIX GUNS BLAZE AS DEATH RIDES THE WEST- ‘DESERT SUN, RED BLOOD’ BY E.W. FARNSWORTH NOW ON AUDIO! MILITARY SCIENCE FICTION MEETS EPIDEMIC THRILLER! “SAVIOR” NOW ON AUDIO!